Staying at the Mercure Paris Notre Dame Saint Germain des Prés hotel ensures you are immersed in the center of Paris and the Latin Quarter. The hotel is a short walk away from Île de la Cité and Île Saint Louis. In Paris city center, the Mercure Paris Notre Dame Saint Germain des Prés hotel is ideally located in the Latin Quarter to visit Paris, to go shopping or just to hang out. You will find nearby the Notre Dame Cathedral, Saint-Michel, the Louvre, the Sorbon ne, the Panthéon, the Luxembourg Garden, and Châtelet Les Halles. Its great location allows a direct access to the Roissy CDG and Orly airports through RER B, as well as Montparnasse train station, Gare du Nord, Gare de l'Est and Austerlitz train station. The Mercure Paris Notre Dame Saint Germain des Prés hotel is set apart by its location in the center of Paris, close to the main attractions, such as Notre Dame Cathedral, the Latin Quarter, Saint-Michel, the Sorbonne and the Panthéon. 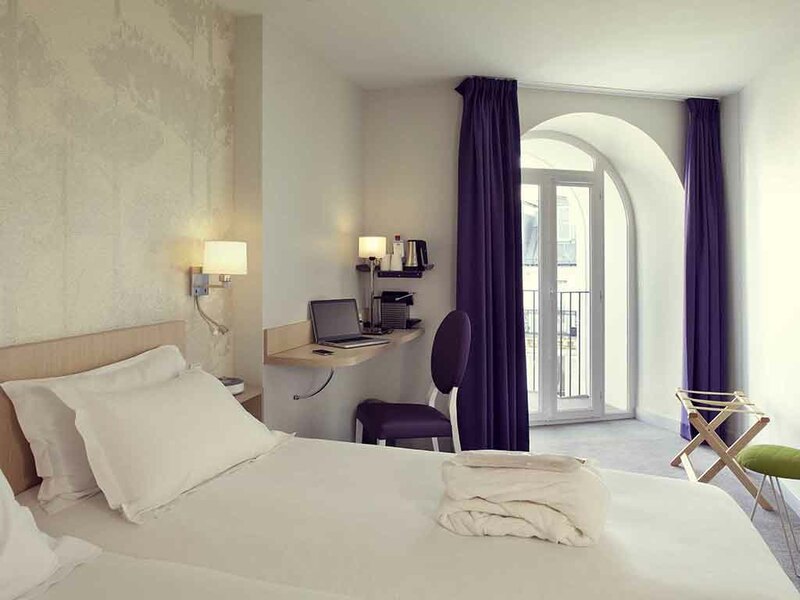 The Mercure Paris Notre Dame Saint Germain des Prés hotel, located in the Latin Quarter in the heart of Paris, welcomes you to its modern, air-conditioned rooms with free WIFI. All the rooms at the Mercure Paris Notre Dame Saint Germain des Prés hotel have a flat-screen TV with international channels and a minibar. We offer two levels of comfort, the Standard or Privilege rooms. Some rooms enjoy a view of Notre Dame Cathedral. After a long day of working or walking through the heart of Paris, the bar at the Mercure Notre Dame Saint Germain des Prés hotel invites you to enjoy a moment of relaxation, every day from 6:30am to 1am. had to buy bathroom amenities. hotel only supplied a single all in one soap. no toothpaste. Great staff , good quality rooms, very noisy. Great staff , good quality rooms, it is very noisy outside and the windows are very weak . The location was ideal for visiting the centre of Paris. The staff were friendly and helpful The room (a Privilege Room) was minuscule. The breakfast was well below Hotel Mercure standards with soggy almost inedible vienoisserie. Would I go back? Almost certainly not. Room was a bit small for working purposes as the working pult was too close to the bed. Bud the hotel was nice and room was clean. The hotel staff were extremely accommodating, friendly, and helpful. We would certainly return. Superb Hotel and unbeatable service! My partner and I stayed for only one night, but Mercure team did their best to make our stay special. Jerome, GM and the others collaborated with my partner to give me a surprise, so they decorated the room in a very romantic style and when we arrived my boyfriend (now fiancé) proposed me. Thanks to everybody that kindly created such a beautiful atmosphere for us. On the other hand, the location was very convenient and breakfast was tasty and very healthy. I totally recommend this hotel if you are looking for a memorable trip. We arrived around midnight and it took a minute or two for someone to appear to give us our keys, something other reviewers have commented upon. Personally I found this perfectly fine and the person who booked us in was friendly. Our room was small, it would not be suitable for someone with mobility issue or a larger person but suited us fine. It was well appointed, with a small balcony, very comfortable twin beds, a roomy and efficient shower bathroom. Breakfast was the expected high standard of Mercure. The staff was outstandingly friendly, cheerful and helpful. The hotel location is great with good restaurants (Oyster bar across the road) nearby and a very 'safe' feel. The reception desk booked a cab for us back to the train station, a process which was fast and cost the same price than our journey to the hotel contrary to other reviews. I would definitely go back. Really super staff room front desk to room cleaners. All the staff was very friendly and antentious. Give my compliments to Mr. Jerome and Mr. Muhamed and all the other receptionist. I would gladly return to this hotel. The staff is very friendly, helpful and professional. Mohammed and the other front desk staff member were outstanding. The rooms very small. which was the only reason the experience was an 8. The attention from the staff was great, the room was clean and in order, however there were always noises at night like a leak from the walls that never stopped. Also 2 times de fire alarm triggered for a false alarm.